The Catoosa County Schools Child Nutrition Program is not just a "filling station". It is an integral part of the educational system. The Child Nutrition Coordinator, as well as school cafeteria managers and their staffs see mealtime as an opportunity to integrate nutritious, well-balanced, low-cost meals with educational objectives. All cafeteria managers take classes in nutrition, quantity food preparation, management, food safety, and sanitation. Each cafeteria employee receives specialized training in food production and service. 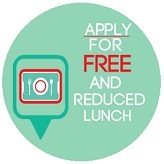 Because the system is a participant in the National School Lunch Program, qualified students may receive the same meal at a free or reduced price. If household income changes during the school year, applications may be made immediately to receive meals at the lower rates. Interested parties should contact the Child Nutrition Department at 706-965-2414. All information is kept confidential.